Memes are a form of unfiltered public discourse, moving seamlessly between a creator, a photo app, and the public. They’re often used to express a common sentiment or visually establish a point. They’re certainly popular. When viral, a meme may be seen by millions. We wondered whether content portrayed by meme is perceived differently than the same content portrayed in text. In other words: does the memeification of an argument boost credibility with readers? The kneejerk reaction is to assume that memes – given the silly nature of most of them, such as a tea-drinking Kermit the Frog making snarky points about foreign affairs – would diminish the seriousness or perceived credibility of content. At least historically, memes have been used to convey material that is already established as common sentiment. Even where that first condition is not really met, memes require agreement (in the form of “shares”) to spread between viewers, with each posted meme carrying the endorsement of every person who shared it to that point. Memes may therefore be perceived (particularly by low-information consumers) as representative of public sentiment, even when their message is in actuality based on complete bunk. Put in the language of cognitive psychology: we suspect that memeification serves as a heuristic or proxy for credibility. Much like people receive content from trusted messengers with less resistance than unknown spokespersons, memes give people the sense that the content has passed muster with innumerable others, likely including their own online friends. More simply: the content wouldn’t have been meme’d if it weren’t considered obviously true to so many already. Now, this isn’t going to be the case for every person. But in the aggregate, we suspect that memeification matters and that it matters the most for information that needs more credibility than it truly has. Zika virus is a conspiracy created by the U.S. vaccine industry to boost vaccine sales. Reptoid aliens masquerading as humans live among us and control our minds and government. Foreign antivirus software companies create viruses to boost sales of their products. We presented each of these questions in two forms, as a meme and in text only, making for 6 different treatment groups. For respondents viewing content on Reptoids in text only, just 6.7% rated the content as “very” credible. Comparatively, among respondents viewing the same content on reptoids via meme, 11.5% rated the content as “very” credible. Similarly, on Zika, 7.8% of text readers rated the content as “very” credible compared with 11.2% of meme viewers. In other words, the portion of respondents rating the outlandish conspiracies as “very” credible was nearly double as likely among those presented with a meme versus text. On Reptoids, credibility was rated 72% greater for meme viewers than text readers, and on Zika, credibility was 44% higher for meme viewers. For the foreign antivirus company content, which is entirely plausible, memes didn’t matter so much. On this issue, ratings were statistically similar between the meme and text viewers: 22.2% among meme viewers and 24.8% among text viewers. This suggests that the impact of memes in establishing credibility is most important for those issues that are inherently less credible to begin with. This pattern holds across demographic groups. There are some differences in how much memes matter based on age. For example, our meme treatment was the least influential in driving perceptions among 18-24 year olds (those who are perhaps most familiar with memes) and among those ages 65 and older (those who are perhaps the least familiar with memes). For our youngest demographic, this implies that familiarity with memes and an understanding of where memes come from may lead to an immunity to their effects. For our oldest demographic, this implies that the “only common knowledge content becomes a meme” thought process doesn’t take place, either. For the majority of adults, however – those ages 25-64 – memes appear to fulfill their function as a substitute for a well-supported argument. Men and women are equally susceptible to the role of memes in inspiring the perception of credibility – with a few notable differences in how. Men, it turns out, are overall more likely to trust sketchy information. Or, one could say, women are more skeptical than men of the information they see online. While men and women scored nearly identically on the perceived credibility of the (credible) antivirus content, when it comes to conspiracies, men are more likely to take the bait. Among men, 17.1% rated the reptoid meme as “very” credible, compared with just 5.3% of women. On the Zika meme, 14.6% of men and 9.5% of women rated it as “very” credible. That said, the relative impact of memeification is equally matched between genders: Overall, female perceptions of credibility jumped 78% between text and meme treatments, while male perceptions of credibility jumped 71% between text and meme treatments. This suggests that while men may be more likely to believe in conspiracies, men and women are equally likely to trust this type of information more when it is presented in meme form. So what is the takeaway from this experiment? Memes serve to disseminate information in a way that doesn’t trigger scrutiny from viewers. Much like certain diseases take hold in the body because they are built to evade immune response, memes are built to communicate the safety or truthiness of a message even where it is not deserved. While meme authors may not make their quippy art with the intent to deceive, the medium inspires acceptance to a greater degree than the same information would enjoy in text form. So there you have it, Success Kid, you’ve been a part of something unique in the history of communication. 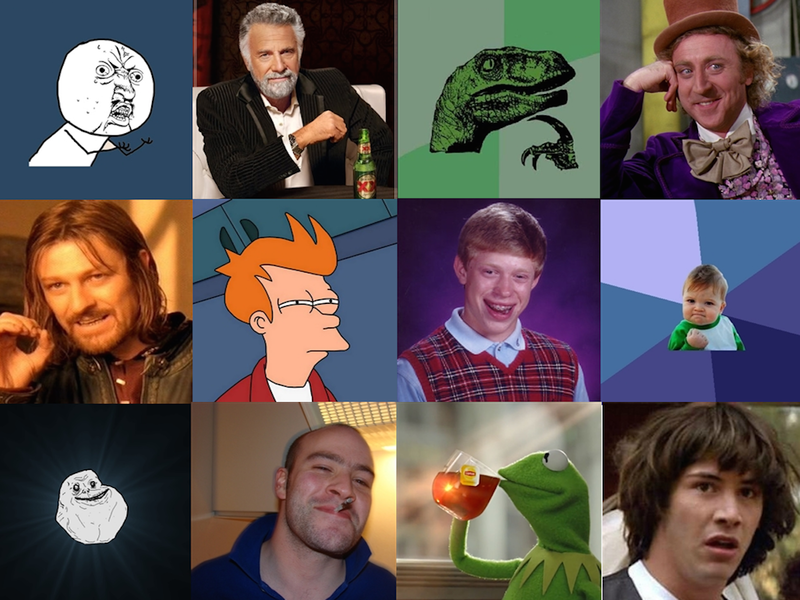 You, Bad Luck Brian, Grumpy Cat, Condescending Wonka, and Philosoraptor, too. Andrew Bryant also contributed to this article.